Jennifer Fletcher currently Lives and works in Melbourne, Australia and also in Valtiberina, Toscana, Italy. 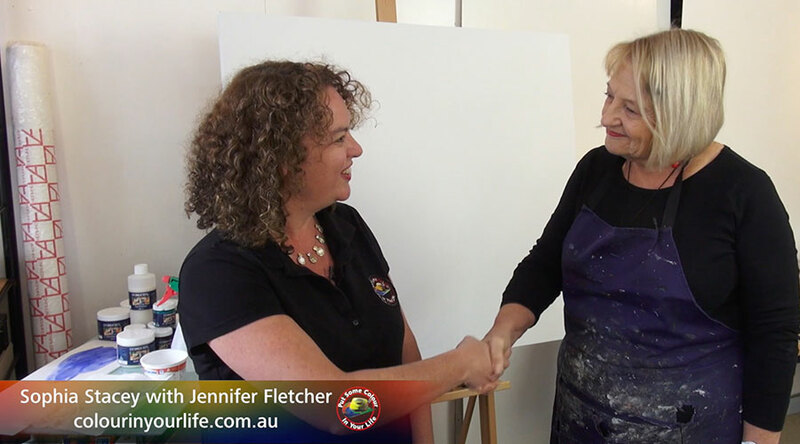 Jennifer Fletcher was born in the New England area of New South Wales, Australia and grew up in a landscape of broad valleys, distant mountain ranges, clear skies and an extraordinary clarity of light. Her family were on the land and in aviation and some of her earliest memories are of the world as seen from above. These early experiences inform all the artist’s work. Strong original imagery that is bold in colour and form where the artist explores exotic inner landscapes, fragments of memory and what she perceives as connections of spirit. Working intuitively and often in layers the artist creates images with an incredible depth of colour, emotion and movement that draws the eye into, around and through the work. Advances in modern printmaking technology help to fulfil the artist’s desire to make contemporary art accessible to a broad audience and involves many diverse art making techniques that include painting, printmaking, collage, drawing and photography and which also allows the exciting ability to play with scale. Here is a great place to get stuck in with Jennifer Fletcher.